A job interview does not have to be daunting once you know what to expect. 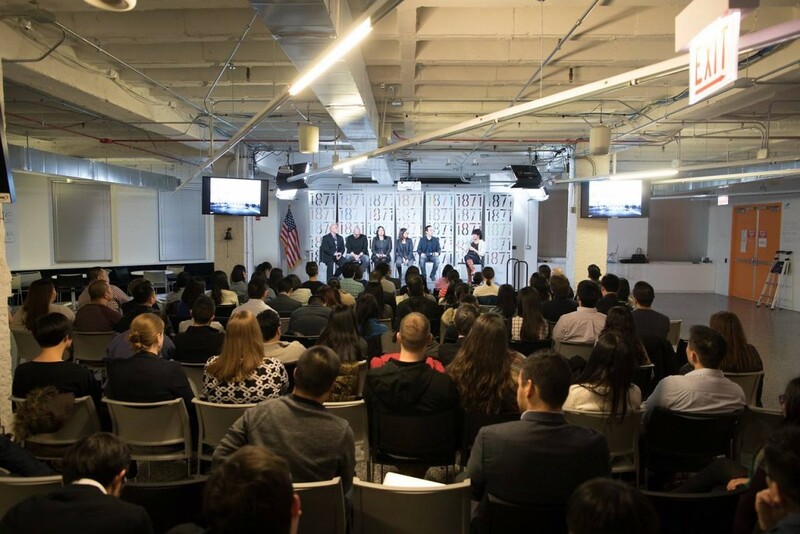 Join TAP-Chicago for a free mock interview session with experienced professionals from a variety of fields including accounting, computer science, law, and marketing. Give yourself the opportunity to interview with an experienced professional from your intended career who can provide you with insider knowledge of what to expect and how to best present yourself for your ideal job. Interviewers and interviewees will be paired up according to the background and interest. The event will be two-fold: first, recruiters will help interviewees prepare for the mock interview and then the interviewers will conduct the mock interview. After the mock interview session, there will be a networking session for everyone at the event. We encourage you to register soon as space is limited. Mock interviews will be scheduled based on availability, first-come, first serve basis. Any questions, please contact ada.tong@tapchicago.org. 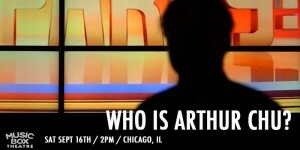 Please join TAP-Chicago to enjoy the theatrical premiere in Chicago – WHO IS ARTHUR CHU? on September 16th at 2pm at the historic Music Box Theatre! Each ticket is only $12, and you can enjoy $2 OFF using promo code “TAP” here. Run Time: 90 minutes (Check out the trailer below)! Arthur Chu hacked Jeopardy! and won big. Now he’s using his newfound celebrity to battle dark forces on the internet as a blogger and cultural pundit. Raw, unfiltered and poignant, we follow Arthur as he realizes he can only create positive change in the world if he first heals his own wounds by reconciling with his estranged family. 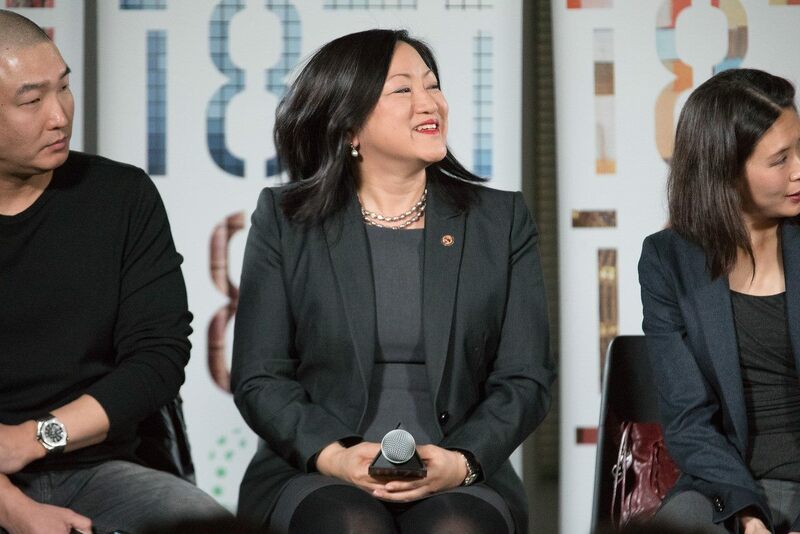 Featuring a Q&A with Scott J. Drucker and Yu Gu, moderated by Chicago-based journalist, Peter C. Baker, a freelance journalist and contributing editor at Pacific Standard magazine. In 2015, he profiled Arthur Chu, and in the years since has written extensively about masculinity and the Internet for New York Times Magazine and Elle. He is a 2017-2018 Carter Center Fellow in Mental Health Journalism. TAP-Chicago has procured DISCOUNTED tickets at $35 (REG. $44) with LIMITED tickets available and on a FIRST COME, FIRST SERVE basis. Get your ticket on Eventbrite before Monday, May 15th! 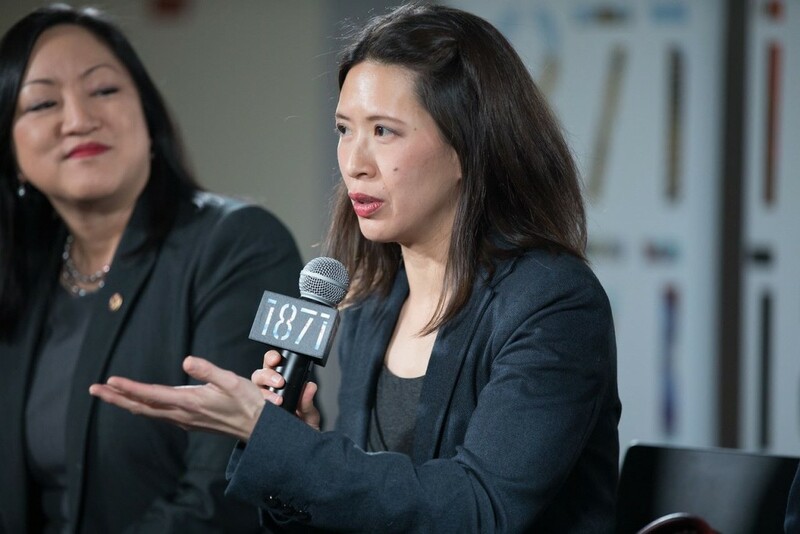 Cynthia Yeh, Principal Percussionist with the Chicago Symphony Orchestra, received a Bachelor of Music Performance degree from the University of British Columbia and a Master of Music performance degree from Temple University. Cynthia joined the Chicago Symphony Orchestra as principal percussionist in June 2007. She previously served as principal percussionist for the San Diego Symphony Orchestra from 2004 to 2007. TAP-Chicago first met Cynthia in early-March when she was one of five panelists who participated in the “The Road Less Traveled” panel program featuring prominent Chicagoland Asian Americans in careers not generally associated with Asian Americans such as careers in the field of performing arts. Join TAP for a special event as we invite you for a night out at the symphony with Cynthia featuring Haydn’s Symphony No. 85, a favorite of Queen Marie Antoinette, and Szymanowski’s First Violin Concerto. After the concert, Cynthia gives a sneak peak behind the scenes with a backstage tour, followed by a meet and greet at Tesori! PLEASE NOTE THAT BY PURCHASING YOUR TICKET ON EVENTBRITE, YOU ARE PURCHASING A DISCOUNTED TICKET THAT IS PRE-PAID BY TAP-CHICAGO WHO WILL BE ISSUING YOU YOUR PAID TICKET FOR THE CONCERT. SHOULD YOU OPT TO VENMO YOUR PAYMENT, PLEASE ENSURE TO SELECT THE “FREE TICKET” UPON REGISTERING ON EVENTBRITE THAT CONFIRMS YOU PAID VIA VENMO. 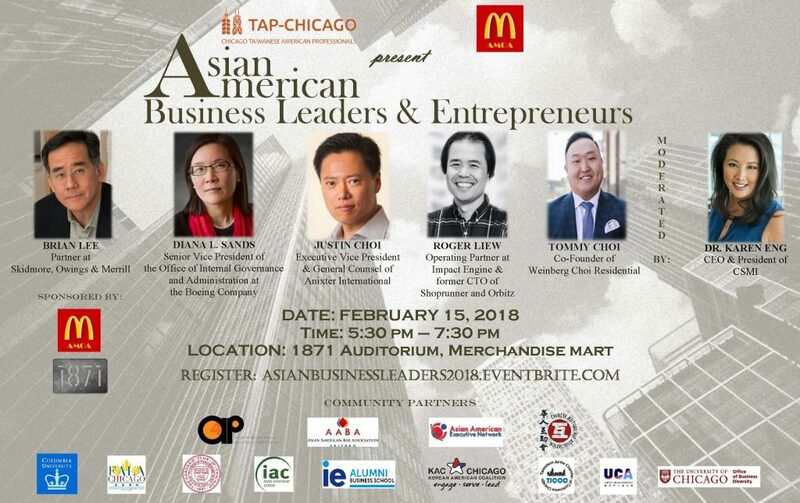 TAP-Chicago’s Leadership & Professional Development Committee presents, “The Road Less Traveled” on the evening of March 2, a panel program featuring prominent Chicagoland Asian Americans in the fields of performing arts, law enforcement, politics, and the culinary arts. The program will focus on the individual and personal stories of each of the speakers through a vibrant discussion and Q&A session where audience members will have the opportunity to further engage with guest speakers. 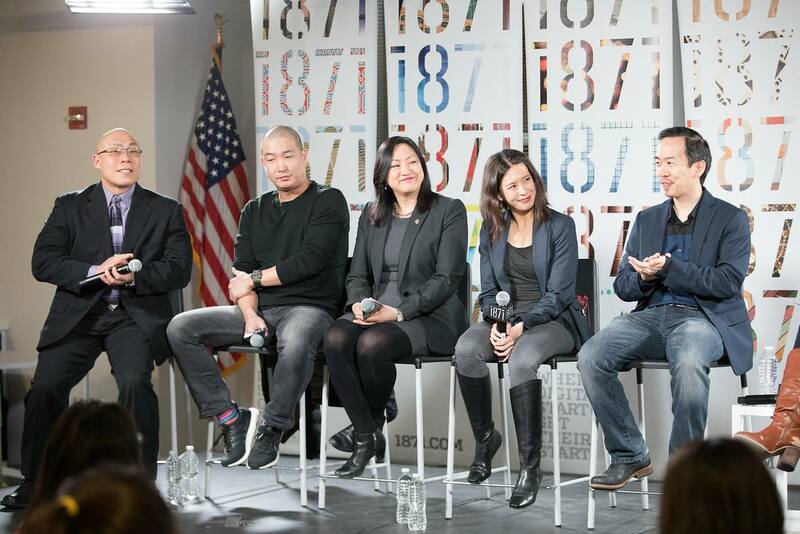 This event is sponsored by 1871, Clarity Partners, and Mr. Pak’s. EARLY-BIRD REGISTRATION ENDS ON FEBRUARY 24TH! GET YOUR TICKET TODAY! Email them to Connie Yip at connie@tapchicago.org. 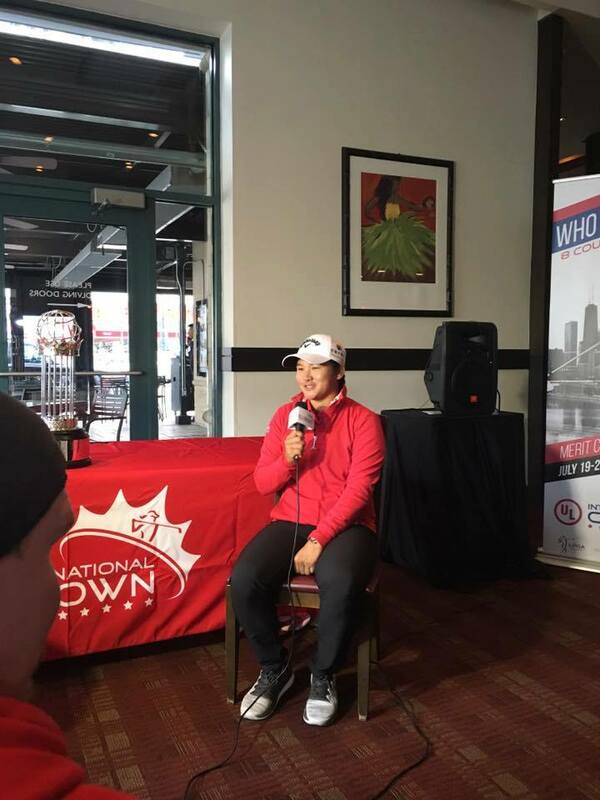 TAP-Chicago had an exclusive Interview with Yani Tseng at Roy’s Chicago on April 4. Let us learn about Yani’s career aspiration, accomplishment, and her favorite Taiwanese Dish. TAP-Chicago: What is your favorite personal accomplishment of your career and why? Yani Tseng: That is a tough question. There are couples of my favorite accomplishments. The first one is my first British Open in 2011. On Sunday, I was nervous for the whole day. The last hole was 280 yards into the bunker and into the wind. I thought I would never get there. However, I hit my best drive of the day, hit into the bunker and I chipped out. It was an easy par five and then I won the tournament. It was my best memory every. The other one is my first LPGA Tournament in Taiwan. There were thousands of people showed up. I was so excited that so many fans in Taiwan came to cheer for me. It was unbelievable. I was sitting on the tee and I cannot forget so many people were clapping and cheering for me. In addition, that was the time for me to realize that golf was getting popular in Taiwan and that people start to pay attention to golf sport. I was very happy to see that happened. TAP-Chicago: What would it mean for you and your team to win the upcoming Crown International? Yani Tseng: Golf is a very individual sport. This is the time we all get together and play for our country with our teammates. Last time we did pretty well. We defeated the American team in the first day with a score of 4:0. We lost the second day. We did not have a captain so we had to figure out whose game is better, who goes first, etc. So there are many strategies to be developed even thought, we had only four players. This year we will figure out the way to do better and bring the crown home. TAP-Chicago: As an accomplished female athlete, what messages do your have for aspiring young females? TAP-Chicago: In this highly competitive environment, what do you do to manage stress or do for relaxation? Yani Tseng: Managing stress is very hard. This is the toughest time in my career – I almost cry every day. It is tough because I know that I can win the tournament physically but my mental status is not ready when the tournament comes. When I step on the first tee, I just cannot pull the trigger. I was fearful to make mistake. I knew I have to push myself to fight in the golf course, to keep trying and never give up. I have many ways to relief stress: I like watching movies and drawing. Still, it is tough. The tournament is always different from the golf practice. The competition makes me nervous but I enjoy being nervous and having the pressure. TAP-Chicago: What is your favorite Taiwanese dish? Yani Tseng: I enjoy all kinds of Taiwanese dishes. If I have to pick, I will say Taiwanese Bento Box and Hot Pot. 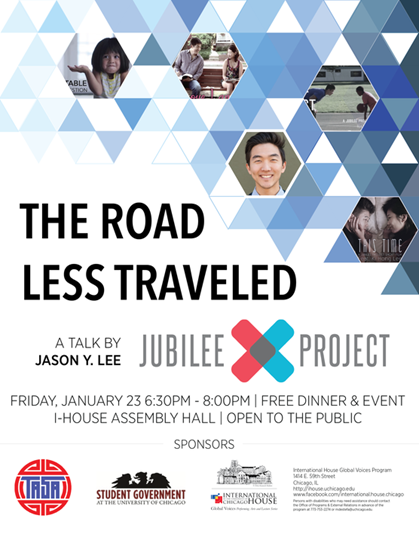 The University of Chicago’s Taiwanese American Student Association would like to extend an invitation to members of TAP to attend its largest event of the year, The Road Less Traveled: A talk by Jason Y. Lee from the Jubilee Project. The event will take place on Friday, January 22nd from 6:30 to 8:00pm in the International House Assembly Hall at the University of Chicago (1414 E 59th St, Chicago, IL 60637 ). In addition to the talk, the Jubilee Project will be screening a few of their new projects and opening the floor up for a discussion. Attendance is free and light refreshments will be served! The Jubilee Project is a non-profit that inspires change through telling stories and filmmaking. United by their passion for philanthropy and filmmaking, the founders set out to create entertaining content that inspires others to do good. Their videos have attracted the attention of millions of people around the world. Their talk will be centered around their stories and issues of self-identity and awareness. Often times, people try so hard to lead that “perfect” life – building your resume, getting into med school or landing that prestigious job – that they forget why they are in college and what they actually want to do. We hope that through this talk, people will be feel inspired to discover and pursue their passions. On Sunday, TAP-Chicago hosted a Taiwanese breakfast event at Tamarind, where owner Lisa Ko made traditional Taiwanese breakfast food. Thanks to you guys, we had an amazing turnout, and are planning a part 2 next month! Check out our Facebook for event updates. Thank you, Lisa, for making the event possible, and reminding us of our hometown. Click here for more nom nom pictures! and of course, all of our members who came out to enjoy food with us!